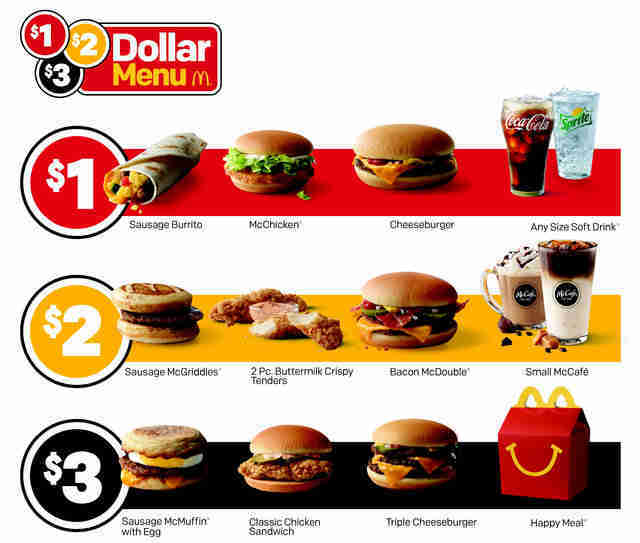 McDonald's New Dollar Menu Starts Today. Here's Everything You Can Get. The prophecy has been fulfilled: McDonald's Dollar Menu is officially back in a new form as of Thursday, January 4, and we are the chosen ones who shall eat it. That new form is actually a three-tier $1 $2 $3 value menu, with a chicken option, a burger option, a breakfast option, and a beverage option in each tier. 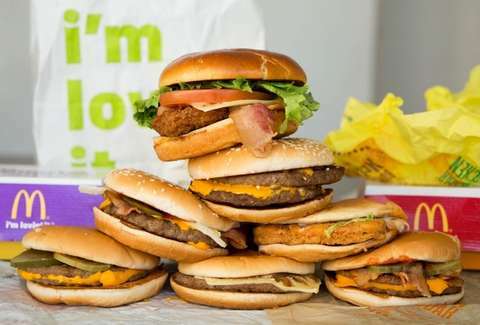 For $1, you have your choice of a McChicken, a cheeseburger, any size soft drink, or a sausage burrito; for $2, two buttermilk crispy tenders, a bacon McDouble, a sausage McGriddle, or a small McCafé; and for $3, you can get a sausage McMuffin with egg, a triple cheeseburger, a Happy Meal, or the brand-new Classic Chicken Sandwich. To herald its arrival, McDonald's is also putting on a game show called "1-2-3 That's a Meal!" on Facebook Live with legendary game show host Wink Martindale and dancing icon Alfonso Ribeiro. You'll be able to play along via the comments at 6pm ET on Wednesday, January 10 on McDonald's Facebook page for a chance to win a $123 Arch Card. There's also the "1-2-3 That’s a Meal!” sweepstakes, which you can enter from January 4 through January 14 by buying an item off the new menu, taking a picture with it featuring "your best game show celebration face," and sharing it on social media with the hashtags #123DollarMenu and #Sweepstakes and tagging @mcdonalds. The winner will have a shot at "tickets to the hottest summer music festivals, a single-season cross-country [sports] stadium tour, or some of the most iconic gaming consoles ever made." Whether you win or not, you'll be spending less money, which is kind of like winning. James Chrisman is a News Writer at Thrillist who is available off-menu. Send news tips to news@thrillist.com and follow him on Twitter @james_chrisman2.